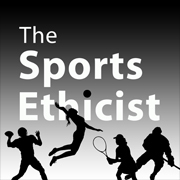 The Sports Ethicist Show airs Monday at 6 pm CDT on Rockford College Radio. Carlson, Chad. “The Reality of Fantasy Sports: A Metaphysical and Ethical Analysis” Journal of the Philosophy of Sport 40.2 (2013). The quarterback fires the ball at you, but the throw is low. You get your hands on it and come up with the ball, but you clearly saw that it touched the ground first. The referee signals a catch and a first down. What should you do? This is not a surprising response. On Thursday morning on the Mike & Mike ESPN Radio show, they discussed the question of whether Golden Tate, a Seattle Seahawk receiver, should have admitted that his controversial game winning touchdown on Monday Night Football was not really a catch. Mike Golic and Mark Schlereth, both former NFL players, responded without any hesitation or qualification that he should not. In marked contrast, in the Italian Serie A match on Wednesday between Lazio and Napoli, Miroslav Klose appeared to score a goal for Lazio early in the game. The Napoli side was incensed, claiming that ball came off of Klose’s hand (ironically, Diego “Hand of God” Maradona used to play for Napoli ). Klose admitted to the referee that this was indeed the case and the goal was subsequently disallowed. Karma did not, however, reward Lazio or Klose: they ended up losing 3-0. Supererogation refers to the category of moral actions that are praiseworthy but not required. Such actions are typically ones we praise individuals for doing but would not criticize if individuals do not. For example, one would likely praise Bob for taking his neighbor Suzie to work when her car broke down. But given that Suzie’s office is thirty minutes in the other direction from Bob’s work, one probably wouldn’t think (separate some special connection or commitment) that Bob is under any sort of obligation to do this for Suzie. Given the anecdotal responses and reactions to the Klose and Tate events, most people appear to regard an athlete’s reporting an error to the officials as supererogatory. While Klose is widely praised for his act of sportsmanship, the outrage at Tate’s “touchdown” is directed almost entirely at the replacement referees and their incompetence. No one seems to expect Tate to own up to his non-catch. And the media attention given to Klose’s handball correction suggests as well that Klose was going beyond the normal expectation. What, then, are some of the reasons offered for the supererogatory viewpoint? Two views seem most common. The “a win is a win” view regards winning is the highest and most important goal of sport. The win is all that matters and, short of outright cheating, it doesn’t matter how one wins. If a bad call puts you in a position to win, that is to be regarded as a gift that ought not be challenged. I don’t regard this view as morally justifiable. Winning is certainly important, but it is not the only valuable thing about sport. Further, how one wins is morally important and cannot be discounted. This view would justify all unsportsmanlike behavior that doesn’t qualify as cheating. The “let the ref make the call” view fairs much better. It distinguishes the roles of the athlete and the officials. The officials have the job of officiating and making the calls. The athlete ought not, on this view, interfere with the officiating: either by trying to get the official to rule in his or her favor or by owning up to an incorrect call. There are sports, such as golf, where the athlete has partial responsibility for enforcing the rules, and the conventions regarding this issue are different. In most professional and elite sports, however, the enforcement of the rules is explicitly removed from the athletes’ purview and vested in officials. For an athlete to be put into the position of making the call muddies the waters of adjudicating the rules fairly and equally. The officials and the athletes have their roles to play, and we ought to endeavor for the sake of fairness to keep these roles clear and distinct. This view goes a long way in justifying the view that an athlete is under no obligation to report to the official incorrect calls. However, it might prove too much. This view suggests that the obligation runs the other way: the athlete ought not to correct the referee. In other words, this view would seem to lead us to say that Klose was in fact wrong to tell the referee about the handball. That goes too far. So where do we draw the line? My tentative answer is that generally the “let the ref make the call” view is correct, but that in situations where the athlete is clearly aware of an egregious error with a game-changing impact, the integrity of the game and his or her own integrity demand that the athlete speak up. The athlete is not making the call; he is merely providing some data to the official. The official, in accepting this data or not, is still the one to make the call. Klose clearly knows that his hand makes contact with the ball on a scoring play, so he seems to have an obligation to inform the official of what he knows. Tate, on the other hand, likely is not in a position to know if he has caught the ball. The rules of possession in the NFL are complex, so Tate cannot be sure that the officials have made the wrong call. Thus, Tate has no business telling the official anything regarding the catch. The case of Tate’s offensive pass interference is similar. In the course of a play such as a Hail Mary, it is hard for the athlete to know if his contact with the opponent is sufficient to trigger an interference call. I am not entirely convinced by this, however. It has an ad hoc feel that rationalizes the status quo. I think we could do with more athletes acting like Klose. And I think we could do with a better account of why.